This ad scares me a bit. 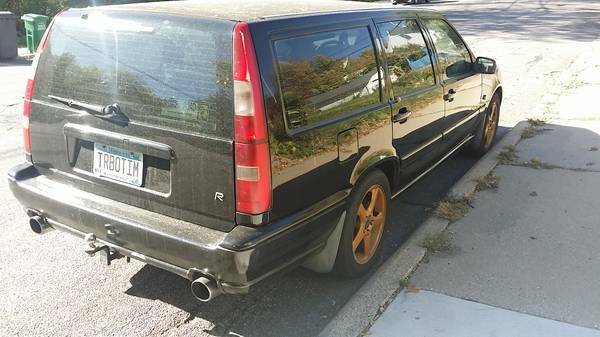 Mostly because of the “turbo” part and there’s not one picture of the engine… But a manual turbo wagon with a ton of boost? 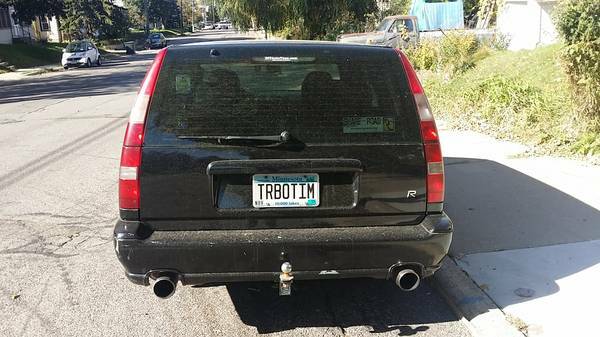 Here’s the ad from the minneapolis Craiglist in case its gone by the time you find this. 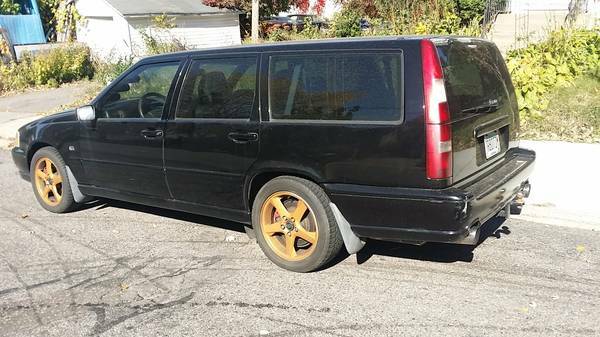 LOOKING TO SELL MY CRAZY BUILT V70R!! I will post picture when I get into my shop later but I am looking to sell this car. For people who don’t know me I have way too many cars. 619 WHP CL65, 11 second Talon, 242 with LS1 and big turbo, old Mercedes diesel that makes 500hp with OM606 engine, a duece and a half, the list goes on and I now wanna get a G wagen and old 560 SEC. Here is a 140mph pull. So I wanna put this up for sale. I was using it as my winter car but I usually can drive my S70 AWD. Now for the specs or what the car is. It started out as a 99 V70R. It has 120k miles. 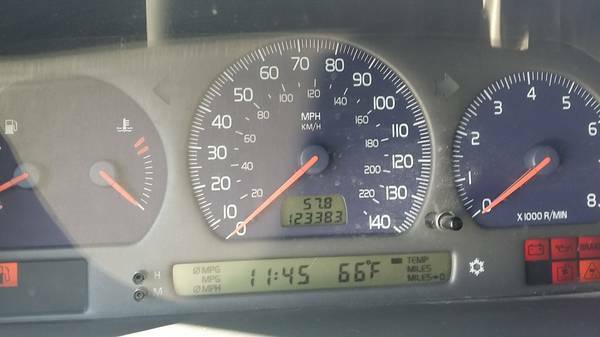 Motor has just under 20k miles. The motor is fully built with aftermarket rods and pistons, it has the lighter 2004 and up crank. Custom sheet metal intake manifold. The turbo setup is very unique and it runs a twin turbo compound setup. It will push 15psi by 2k and 45psi by around 4500. I have not ran it any higher then that as it will strip the T cases pretty quick after that. Small turbo is a 16t and big turbo is a GT35R. I also swapped a 6 speed from 04 and up R. The car is ran on Megasquirt 3 and working AC and guages run off stock computer. Car was drive by wire but now cable. Mostly ran on E85 but I did make a gas map so I could run it on the coldest days of Minnesota but it could still use some work on gas tune. Has the usual supporting mods like massive intercooler and such. The radio was stolen and I keep meaning to put something in but just never do. I also have 3 t cases to go with it. I think 2 are still good and we can confirm. 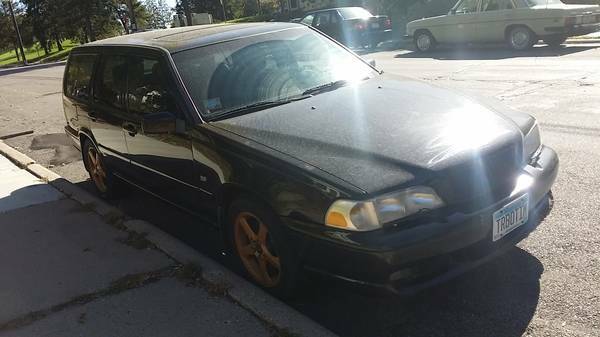 I would like to get 5k for the car but I know my market is limited so we will see. I think if I parted it I could get more but time is more important than money for me. If anyone wants to check it out or drive it let me know. My shop number is show contact info and you can call or text with any questions. My cell is show contact info but I wont answer that during work hours. Thanks everyone and pass it along and share it. This car needs a good home to someone who can love it as much as I did years ago. Car currently has a stockish clutch so my wife could drive it. 2 years ago I had clutch masters make me a $2500 custom twin disk as I couldn’t get a clutch to hold the power but the clutch could use a rebuild and it’s around $400 in parts from clutchmasters so I replaced it with something my wife can drive. If you didn’t want to run as high of boost you could probably get away with a weaker clutch as this clutch has pretty abrupt engagement and is one of the reasons I removed it and put a more stock clutch. I would be willing to add this clutch in with the deal for $700 otherwise I am selling separately. For those that want buy it, see this link before its too late. ← Previous Post: For Sale: 1995 M3 LTW – The Most Expensive E36 Ever?